Today marks the 123rd birthday of Mr. Jimmy Durante, who was born on February 10, 1893. Before his most famous years as a beloved comedian, the Great Schnozzola got his start as a pianist in the earliest years of jazz music on record. This record features two of his sides as a sideman with Ladd’s Black Aces (none of whom were black or named Ladd). Connorized 3011 was recorded in September of 1921 in New York and originally appeared on Gennett 4762. Connorized Jazz Hounds is a pseudonym for Ladd’s Black Aces. The personnel features Phil Napoleon on trumpet, Moe Gappel on trombone, Doc Behrendson on clarinet, Jimmy Durante on piano, and Jack Roth on drums. The Connorized label was produced by Starr Piano Co. using masters from Gennett. “Shake It and Break It Blues”, is a fine early jazz tune. I believe it is Sam Lanin that interjects the brief vocalization. 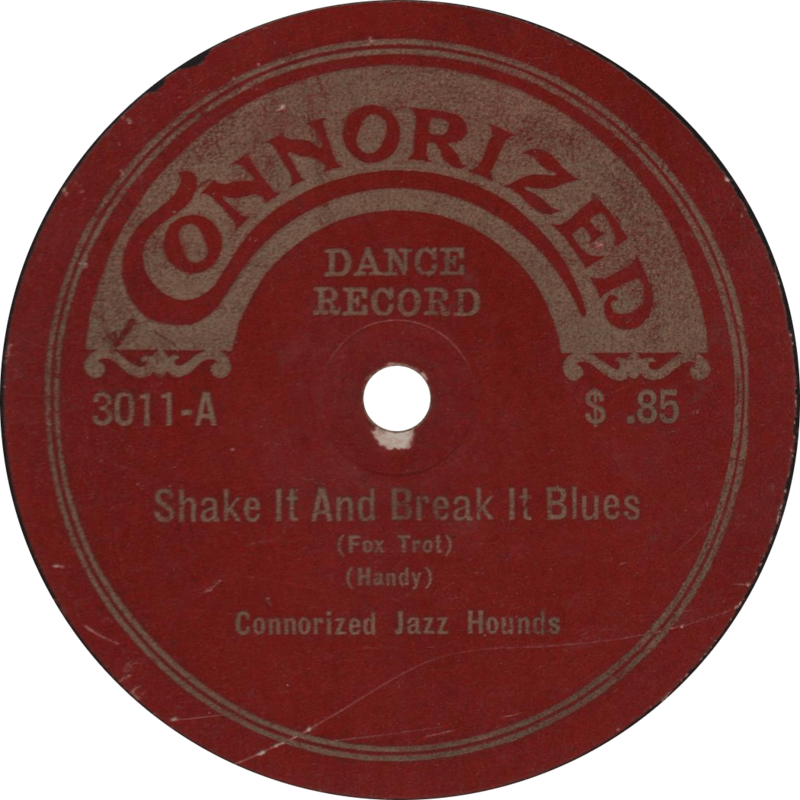 Shake It and Break It Blues, recorded September 1921 by Connorized Jazz Hounds. The flip, “Aunt Hager’s Children’s Blues”, is a classic W.C. Handy blues song, and does not disappoint either. 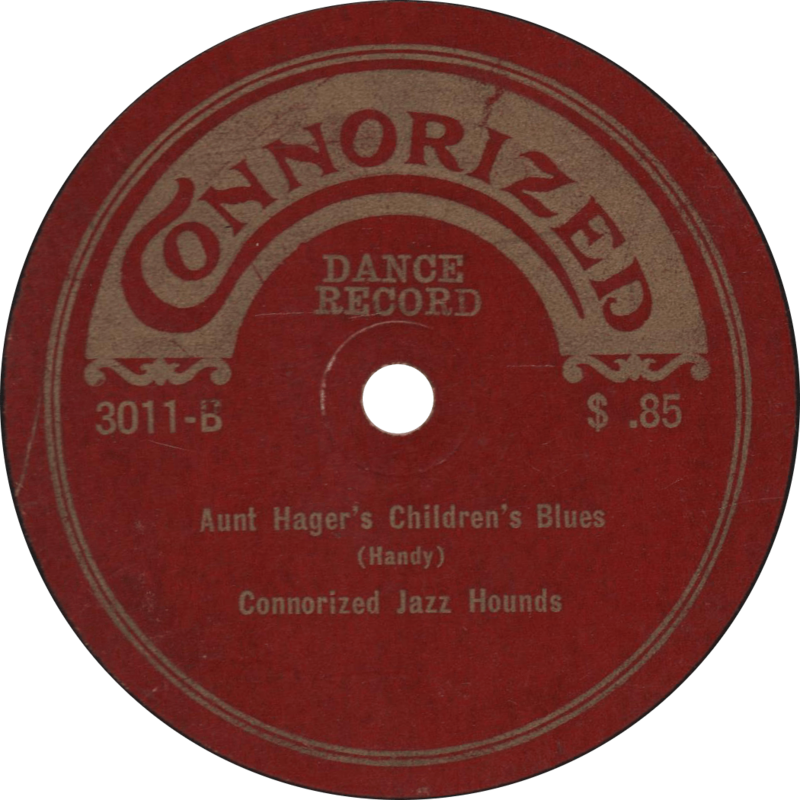 Aunt Hager’s Children’s Blues, recorded September 1921 by Connorized Jazz Hounds. This entry was posted in Records and tagged 1920s, 1921, Connorized, Doc Behrendson, Jack Roth, Jazz, Jimmy Durante, Moe Gappel, New York, Phil Napoleon, Starr Piano Co. by R. Connor Montgomery. Bookmark the permalink.